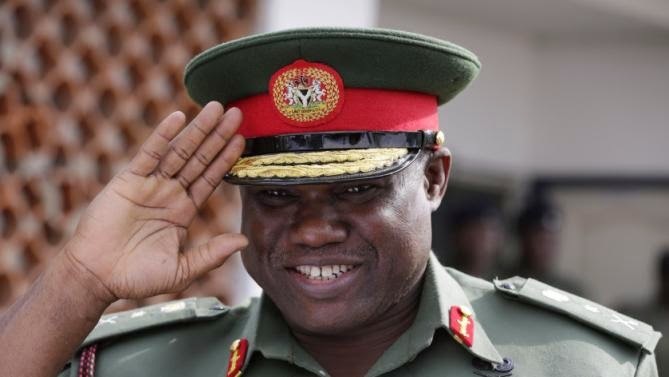 The Chief of Army Staff, Lt Gen. Kenneth Minimah, on Tuesday said over 600 army officers have so far been trained from a range of specialist courses at different military institutions abroad, while new military equipment have been acquired to boost the fighting capacity of security forces in line with current trend. He also assured Nigerians that the military will soon recapture all territories in the north east which were under the control of the Boko Haram sect. He gave the assurance during a training seminar for army officers held at the Armed Forces Command and Staff College, Jaji, Kaduna State. The training in collaboration with the British Military Advisory and Training Team is part of the ongoing war against the Boko Haram terrorists in the north east. Addressing the officers at the event, Lt. Gen. Minimah, stressed the need for continuous training and re-training of army personnel for them to be able to tackle the current security challenges facing the nation. He disclosed that the Nigerian Army had in the last one year embarked on intensive individual and group training of personnel within and outside the country, adding that such initiative is already yielding positive result with the recent onslaught against the Boko Haram insurgents in the north east. Over 100 officers, including Commanding and Brigade Officers, were drawn from the various army divisions and units to attend the seminar, which will last for five days. The training will focus on capacity building development in three areas; intelligence and analysis, operational capacity building and force sustainment. These areas, according to the organizers of the seminar, are critical in the effort by the Nigerian Army to defeat the current security challenges. The Army chief who noted that the British Military Advisory and Training Team have been assisting Nigeria in the capacity building of its military forces in the areas of tactics for over thirty five years, maintained that this particular seminar will focus on operation development of the officers aim at making the Nigerian Army a professional force, adding that such collaboration is already yielding good result. Head of the British Military Advisory Council, Brig. Gen. Jonny Bourne, gave an sight of the contributions of his country in capacity building of Nigerian military personnel. He also expressed confidence that such training and collaboration in some key areas will assist Nigeria to overcome the current security challenges. Channels Television’s correspondent in the north-western state, Chmezie Onyeocha, reports that trainings such as this will go a long way in strengthening the capacity of military officers and also develop their mental and physical well being.